Malaysians… we love food. We love our maggi goreng ayam, our ramli burgers, our nasi goreng kambing and all the other epic mamak food. We also love our banana leaf rice, mom’s rendang and our dad’s chicken wine. But once in a while, when we wanna feel like a sir, we hunt for epic fine-dining restaurants. So to ease your search, we’ve compiled 11 fine-dining places for you to try out. Ready your wallets because this is gonna get fancy! This French restaurant on the 23rd floor of The Troika building boasts its award-winning chef, Christian Bauer, who’s a genius in gastronomy. The place also overlooks the KLCC Park and the Twin Towers, lighting up the night’s sky. Its high ceilings and gorgeous chandeliers gives it a sophisticated feel whilst its soft lighting softens the modern interior. The restaurant serves stunning meals such as quality Wagyu beef, creamy fois gras, butter-poached lobster, and a wide array of delectable desserts. Located in Le Meridien hotel, Prime is known as KL’s first international steak restaurant and serves quality cuts of Halal certified beef, imported from the US and Australia. Its décor oozes chic with floor-to-ceiling wine walls and displays its kitchen, allowing mouth-watering aromas to fill the air. Prime is also very detail-oriented when it comes to its meals, offering warm house-baked bread with three types of butter before your meal arrives. Its menu also offers every cut of beef, each order complete personalised according to cut, weight and number of day’s aged. The chef is also skilled in how the meat should be prepped and cooked, and the meats are also served with a variety of sauces, vegetables, and delicious truffle mash. Looking like a warm, welcoming and dreamy Parisian bistro, Bistro à Table is a homely restaurant that is always busy no matter what day of the week it is. Its interior is minimalistic with white brick walls, polished concrete floors, classy art hanging on its walls, and naked bulbs dangling from its ceiling. This gorgeous bistro is 20 minutes away from the city centre, located in Petaling Jaya and has food that’s worth making the trip. Its dishes are mainly modern French cuisines but its kitchen prefers to use local ingredients to ensure affordability in every meal. Bistro à Table also has ever-changing menus that serves meals boasting its flair and staff members that are friendly and prepared to handle large crowds. Looking for another great steakhouse? Here’s Marble 8. The restaurant is a haven for steak connoisseurs, serving the finest Wagyu and Angus meat, flown all the way from Australia. This place not only serves high-quality meat, but also offers a cosy feel. It’s located at the cosmopolitan grounds of Binjai 8, where you can also enjoy a marvellous view of the KLCC tower. Strategically placed in the Grand Hyatt Hotel on the 38th floor, THIRTY8 flaunts its outstanding views of the city with floor-to-ceiling glass windows. The spot does not only include the dining area, but also the bar and lounge to truly heighten one’s experience. Their dishes also ranges from Western, Chinese to even Japanese foods, providing a wide array of quality selection for their diners. To really test its exceptional dining experience, do order their fresh sushi and sashimi, and if you’re craving for something from the west, try out their barbecued Australian Black Angus bone-in short rib. Cilantro is a restaurant and wine car that serves up French and Japanaese fusion food, focusing on quality ingredients and its chef’s cooking skills. Its chef, Takashi Kimura, creates memorable dishes, combining French elegance with Asian flavours. The restaurant’s interior boasts its comfortable cushioned seats with a soft combination of beige and cream colours in order to create a relaxed and calm setting. Lafite KL is known amongst the rich and famous for its French influences and extravagant collection of wines. 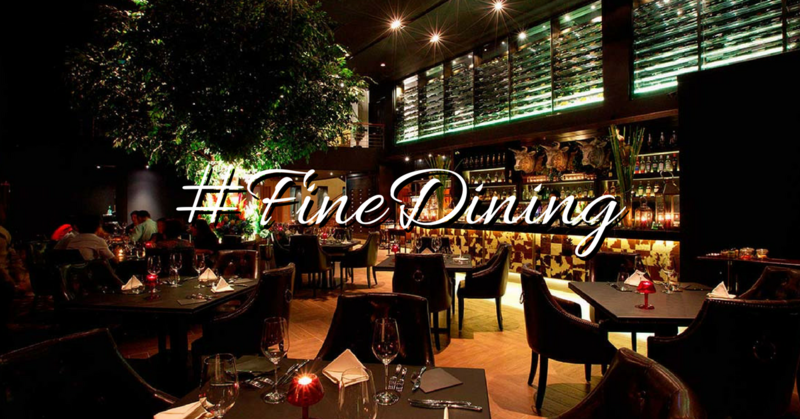 It also prides itself in its fine-dining ambience that will suit any special occasion. Being a fine-dining establishment, you can expect great service with attentive staff that aren’t too intrusive. Lafite lives within the lobby of the Shangri-La Hotel in Kuala Lumpur and is a great place for an intimate dinner for two due to its romantic setting along with tranquil garden views and soft background music. Serving Chinese cuisines, this internationally acclaimed restaurant is located in The Ritz Carlton hotel. It combines elegance and intimacy with traditional Cantonese cuisines for both lunch and dinner. The restaurant has three private dining rooms which can comfortably host over a hundred guests and is famous for its dim sum – perfected by its dedicated chef, Tan Tiong Guan. A must-try is also its signature dish; baked spare ribs with Chinese tea leaves and avocado cream. Yum! Enak KL is known to be a fine-dining restaurant, but what makes it unique is its delicious Malay food. Their ‘Udang Raja Lemak Merah’ is also one of their best sellers, along with their sup ekor, rending padang and daging bakar asam jawa. They pride themselves in, not only their delectable dishes and great service, but also the fact that the restaurant will make you feel right at home. They have also won many well-deserving accolades, giving extra attention to every single detail of their identity; from their food to their ambience. If you’re looking for Malay fine-dining with a warm and cosy feel, this is the place to be. This gorgeous Italian restaurant is right on the 57th floor of the Petronas Tower 3, which is ideal when having a romantic dinner. The breath-taking view is often best paired with the restaurant’s delicious dishes which includes fresh seafood flown all the way from Italy and also imported beef cuts. They also showcase a myriad of premium wines, and if you aren’t sure about which to get, you can ask their experienced in-house staff for some recommendations. And after your meal, you can also hang around in its swanky bar and lounge! Feeling like a sir yet? Malaysia is a food haven, from the mamaks to our own homes to these fine-as-hell-restaurants. And we have a lot of these fine-dining venues. Which one have you gone to? Do share your experiences with us!